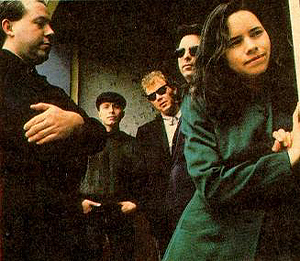 As you are all aware by now, 10,000 Maniacs is an alternative rock band, which formed in 1981 and continues to be active today. The band was formed as Still Life in 1981 in Jamestown, New York, by Dennis Drew (keyboards), Steven Gustafson (bass), Chet Cardinale (drums), Robert Buck (guitar), and Teri Newhouse (vocalist). 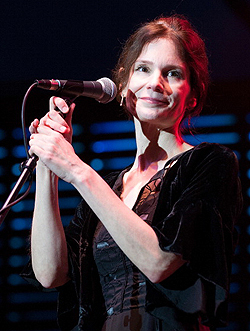 Gustafson invited Natalie Merchant, who was 17 at the time, to do some vocals. John Lombardo, who was in a band called The Mills (along with brother guitarist/vocalists Mark Liuzzo and Paul Liuzzo and drummer Mike Young) and used to play occasionally with Still Life, was invited to join permanently on guitar and vocals. Newhouse and Cardinale left the band in July, and Merchant became the main singer. The band subsequently changed its name to Burn Victims and then, finally, to 10,000 Maniacs. Between March and July of 1983, the band recorded songs for a full length record, Secrets of the I Ching, their debut album, which was pressed by Mark Records for the band's own label Christian Burial Music. They then signed to Elektra Records in November 1984 and in the spring of 1985, they recorded their second full-length album, The Wishing Chair. Subsequent albums included In My Tribe (1987), Blind Man's Zoo (1989), but it was the release of their 1992 album, Our Time in Eden that put the band into the chart spotlight. Containing the lead single 'These Are Days,' the song hit number one on the Billboard Modern Rock Tracks chart in November 1992. They also performed the song for their 1993 album MTV Unplugged. In 1993 the band performed at the MTV Inaugural Ball for President Clinton in January, and on MTV Unplugged on April 21st. Sadly, Merchant announced her leaving the band on MTV on August 5th, 1993. Love Among the Ruins (1997), The Earth Pressed Flat (1999) was then, and after a hefty break, followed by both Music from the Motion Picture (2013), and now, Twice Told Tales (2015). Indeed, their brand new album, Twice Told Tales, now out on Cleopatra Records, showcases the music that inspired the band over 33 years ago and became and essential component of what has become that very recognizable 10,000 Maniacs sound. 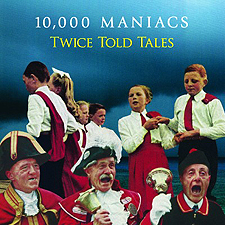 Containing 13 traditional folk songs from the British Isles done in a true maniacal way, Twice Told Tales - which was done with their old friend, and original Maniac, John Lombardo back on board - is an incredible, fresh sounding, and necessary addition to your record collections. I was lucky enough to sit down recently with both Steven Gustafson and Dennis Drew, and my first question was: Taking it from the top, and since its conception in 1981, 10,000 Maniacs continues to record and be active as a band via various line-ups still today. So what is it about the band that has stood the test of time for you guys and the fans? Steven: "W​e live near each other and still like each other. We've always insisted that enjoying what we were doing was most important. When the fun stops, so does the band. We also don't spend day after day with each other. Privacy is important as well. And we like little comforts like nice hotel rooms. A good bed is tantamount to fun. We've had a core gourd of fans that support what we do. We're also reminding people we're still alive." Dennis: "Our changes have been gradual and since we all wrote songs from the very start it was never a jarring change for the fans. I suppose we stood the test of time BECAUSE we modified the line up to fit our needs. It's terrible that Rob died but Jeff has really grown in his role. Mary is a joy to work with." Originally called Still Life and then Burn Victims back in 1981, it was you, Steven, who invited a then 17 year-old Natalie Merchant to come sing with you. A great move, as it turned out. Another was changing the bands name one last time to 10,000 Maniacs. So, a) where did the final name change (10,000 Maniacs) originate and b) do you regret not sticking with either Still Life or Burn Victims? Steven: "Dennis and I were running the college radio station in the summer of 1980 when a shy 16 year old young lady stopped by the station to ask us if we'd play some records she liked. Bob Marley and Brian Eno. She started college that fall and joined​ the station as a DJ. I met Rob Buck when he called the station one night to talk about the tunes I was playing re: Elvis Costello and the Gang of Four." "We became friends. He had a No Wave Noise band called the Obsessions and they were breaking up and he wondered if I wanted to audition for bass guitar. I didn't know how to play it and got stinking drunk on Wild Turkey at the audition and he still picked me. I told him my friend Dennis played piano and we dragged Natalie along to our first rehearsal just for fun. None of us could really play popular music very well so we made up songs." "John Lombardo was author of the 10,000 Maniacs name. I liked the name Still Life, which was Natalie's idea, but our current moniker is very good, if you ask me. It looks good in print and it's always given writers a question to ask." Dennis: "Burn victims was a one off gig. 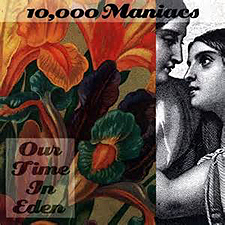 10,000 Maniacs came from a long list that Jahn developed. its a modification of the Herschel Gordon Lewis Film "2,000 Maniacs". Sometimes we tire of the math references it seems to evoke in every media piece." With the success that followed, all the TV shows and performances, the spotlight trained seemingly constantly on the band re: MTV and such, in reflection, what was life like for you guys back then - and do you have any regrets about choices made (at that time) still today, perhaps? Steven: "We were very busy working hard at it and we know the harder you work the luckier you get. We got some breaks. If we weren't on tour, we were either writing songs, rehearsing songs or recording them. There wasn't much time for anything else. ​I got married and bought a house." Dennis: "Life was 100 mph and I loved every minute of it. Although I did drink too much and was sometimes arrogant. In general, it led me to a very happy place." A lot of success, and albums later and in 1993 Natalie left the band, mysteriously citing that she "didn't want art by committee anymore." Was this a shock move for you guys to hear about, given that she publicly announced her decision live on MTV, perhaps? Steven: "She threatened to quit the band every year. We were part time drunken assholes​ and understood where she was coming from, but didn't care. She told us she was really really leaving before we started work on OUR TIME IN EDEN. We decided to keep it quiet for the tour. She was doing things her way and we just got out of her way. I've seen her once in the past 22 years." Dennis: "We knew that Our Time In Eden was the last record and tour and planned to continue on anyway after. It was all very well planned and organized. no hard feelings. We knew from the early days that she would move on at some point. I had hoped for another record, but was not upset. Our model was Fairport Convention." 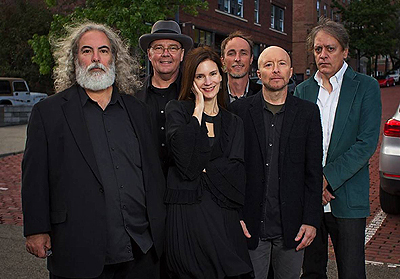 Having undergone a lot of band member changes through the years between 1993 to 2008, what was it about 10,000 Maniacs that caused it to be so fluid, unable to remain stable as a group, so to speak? Steven: "Natalie quit and Rob died. We tried to keep him from leaving but couldn't​. Those are the only real changes. We had another woman, who's name shall not be mentioned, singing with us for a few years. It was a bad decision and we're trying to forget about it. Otherwise, 3/5th of the band has been together for 32 years. Nothing unstable about that." Having now remained relatively stable since 2008, your brand new album is entitled Twice Told Tales. A collection of traditional folk songs, please tell us more about where that album title originates? Dennis: "Shakespeare, Hawthorne and Vincent Price. We love Folk music and Mary inspired us to make an entire album of this material." Steven: "John Lombardo​ came up with the title!" Talking of that very same man, you have welcomed back the founding member himself, John Lombardo, for this album. So how did that all come about? Steven: "John had a good album title.​ He turned us on to British folk rock when the band started. He played Airport and Sandy Denny, stuff we'd never heard and it became a big influence on us." Dennis: "John knows the folk world like the back of his hand ... and he's really funny!" Please tell us more about the cover art for the CD and what it represents with regard the album's music? Steven: "​The album cover is an original work of art by John Lombardo. He showed us five and we picked that one. I liked the colors and the guys yelling. It doesn't get much deeper than that​." Dennis: "Only John knows and he's not telling!" You actually took a different route to getting this CD out to the public by using the music site Pledge Music to offer incentives to them for their kind monetary donations to the project. Was this always your go-to idea to get this album out, and if so, was it smooth sailing with that regard? Dennis: "Steve has led us deep into social media and crowd funding. More to come!" Steven: "This was our second pledgemusic.com campaign. It's fantastic. Direct to fans and works like a charm." I love the fact this was also released as a limited edition 180 gram deluxe white vinyl LP! I'm an audiophile so, these kind of new releases make me VERY happy when also presented as a vinyl option. My question to you is why was it white in color though? Dennis: "Our last record in 2013 had other colors. Pure white for pure music? I really don't know, actually." Steven: "That was something the record company did. They never told us.​ It was a big surprise to us!" Mary Ramsey's vocals are perfect for this kind of music, if I may say. So, one has to ask, was the opening song 'Lady Mary Ramsey' written for her, perhaps?! Steven: "​Not sure who the author was. Mary found the songs researching for the record." Dennis: "Actually, she Googled her name and found sheet music for those two fiddle tunes from around 1790!" ​ Did you record a few more of these songs, that didn't make it on the album, to maybe put out an expanded deluxe edition of the album down the line? Dennis: "I think we ruined a couple we probably won't release." With this album out now, are you contemplating using Pledge Music for your next album? And what can we expect from this next album, have you any ideas yet? Steven: "​We're working on a live album at the moment. We may or may not do a pledge campaign for it. After that we're going to start work on an album of new original material." Dennis: "I think we'll do some sort of electric live record since we've never done that properly." Finally, we here at Exclusive Magazine LOVE penguins, so we were wondering if you did also and/or if you had your own personal stories about them? Dennis: "I love penguins too, but have only seen them at the Aquarium in Chicago!" Steven: "I'm a Buffalo Sabres fan!"